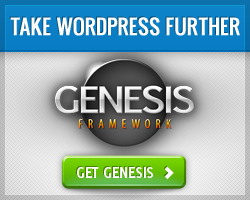 Another Genesis WordPress Theme Giveaway – Enter Today! The last Genesis theme giveaway went over so well I thought I’d have one again. Plus, these kinds of posts are convenient to write when you’re taking a break for the Holidays. So it’s a win-win for you and me. Entering is just as easy as last time. Just reply to the question below and you will have a chance to win the Genesis framework and a child theme of your choice! (An $80 value). Since the year is coming to a close and 2013 is only hours away, I figured I’d make the question related to your goals for 2013. Tell me one thing you will do to promote your site next year that is different from what you are doing now? Or name one strategy you will implement to take your site to the next level? I will use Random.org to choose a number. The comment number that corresponds to what I draw will be declared the winner. Be sure your email is correct (won’t be displayed) so I can send you the theme files if you win. Contest ends Wednesday, January 9, 2013 at 11:59pm CT. Good luck and happy new year!